I encourage all of you to go see "Juno," written by my fellow old-school Hesterman blogger Brook! Exactly one month later, I'm back. Wow. I'm a slacker. Not too much going on here. While California has been burning for the past couple of months, I have managed to stay out of harms way. Matt and I haven't been up to much, just trying to stay relaxed before the rush of the holiday season. 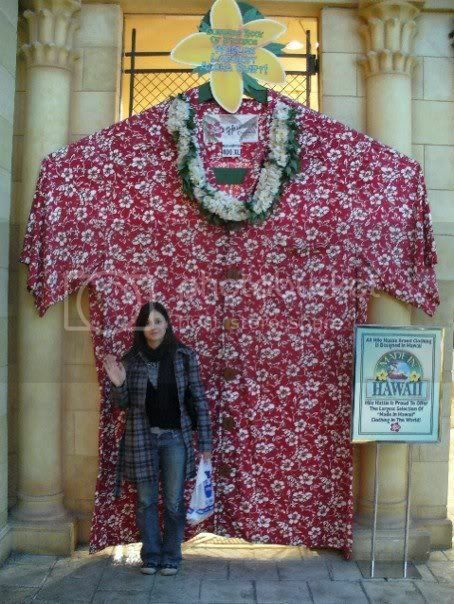 We went to Las Vegas for Thanksgiving where I posed with the largest Hawaiian shirt in the world. We ate tofurkey; the world was well. Last night, we went to see Sea Wolf, Datarock, Pinback and Spoon at the Avalon. Besides the fact the line-up was amazing, I got to visit the Avalon for the very first time. For non-Californians, it's like the Aragon Ballroom, only smaller. Sea Wolf opened. I only know one song that I've heard on the radio and enjoy, so I'm glad I got to hear the rest of the album. I've heard Ken speak of the joys of datarock live, so I was super excited to see them. They were so much fun, and ended their set with a recording of the theme song of "Dirty Dancing" - "I've had the time of my life" - complete with sax solo and all by a datarock member. Good times. I have already seen Pinback in the past, and they always put on a good show. Jen hearts Pinback-everyone should know that by now. Spoon was amazing live, and I am so glad I got to see them in a smaller venue before it becomes impossible to do so. Great show! That's all I can say.